After first announcing a low-priced Chrome OS computer on a stick back at the end of March, Asus has officially released the Chromebit CS10. For the low price of $85 (about £56, AU$120), the Asus Chromebit is gum packet-sized micro desktop that transforms any display with an HDMI input into a smart, cloud-connected display. Other than a screen, all it needs power and a Bluetooth-connected keyboard and mouse to work. The Chromebit is more or less an Asus Chromebook Flip packed into a much smaller package. The dongle comes outfitted with a quad-core 1.8GHz Rockchip 3288-C with Mali 760 graphics, 2GB of memory, 16GB of solid state storage, Wi-Fi, Bluetooth 4.0 and a USB 2.0 port on the end. While Asus and Google have teamed up to introduce the Chromebit CS10 as the world's smallest Chrome device, there have been plenty of similar dongles out of China. 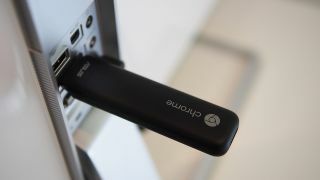 We're still in the midst completing our full review on the Chromebit, so stay tuned to how it stacks up to other PCs-on-a-stick running Windows 10 from the likes of Intel and Lenovo.